Oh yes it’s another fabulous gift card giveaway before summer is over! We love this one, and who wouldn’t love a $250 gift card of their choice? Seriously who wouldn’t love that, I know I would love to win. Fortunately this one is for all of you! 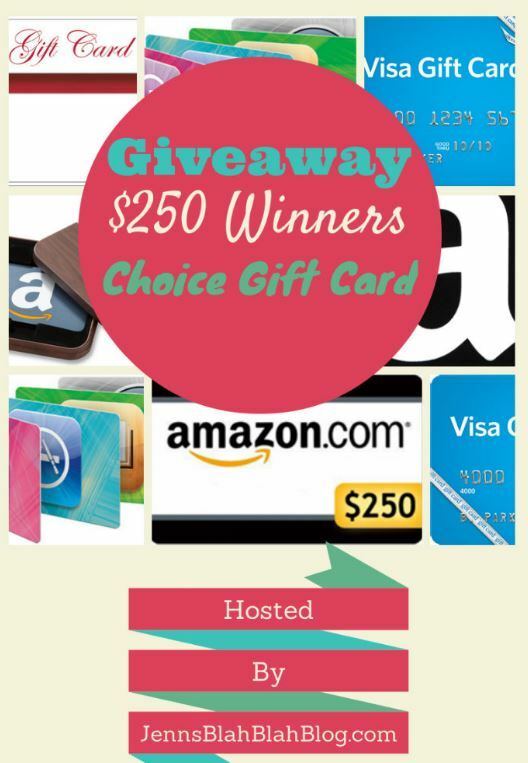 Welcome to the $250 Winners Pick It Gift Card Giveaway! One super lucky winner will win a $250 gift card to Walmart, Target, Albertsons, Amazon, Sams Club, and more. If you win you get to pick where you want your card. I have to say over since I have been doing this 90% of people choose Amazon, which I don’t think I would choose different. You can get everything and then some from Amazon but if you’d rather have Visa we will do that. This is our way of saying thank you for everything you do for us, because without you this blog isn’t here. Jenn’s Blah Blah Blog and some of her favorite bloggers are celebrating, our readers with a Monthly Gift Card Giveaway! One SUPER Lucky Person will win a gift card of their choice valued up to $250! Yepie, perfect with the holidays coming up! You know how it works, 1 person chooses a gift card – Amazon, Walmart, Target, Visa and anything else you can think of. We want this giveaway to be open to all of our loyal readers! Thank you for everything you do to make our job as bloggers as amazing as it is! It’s because of you that we are able to do what we do, and we cannot say thank you enough. 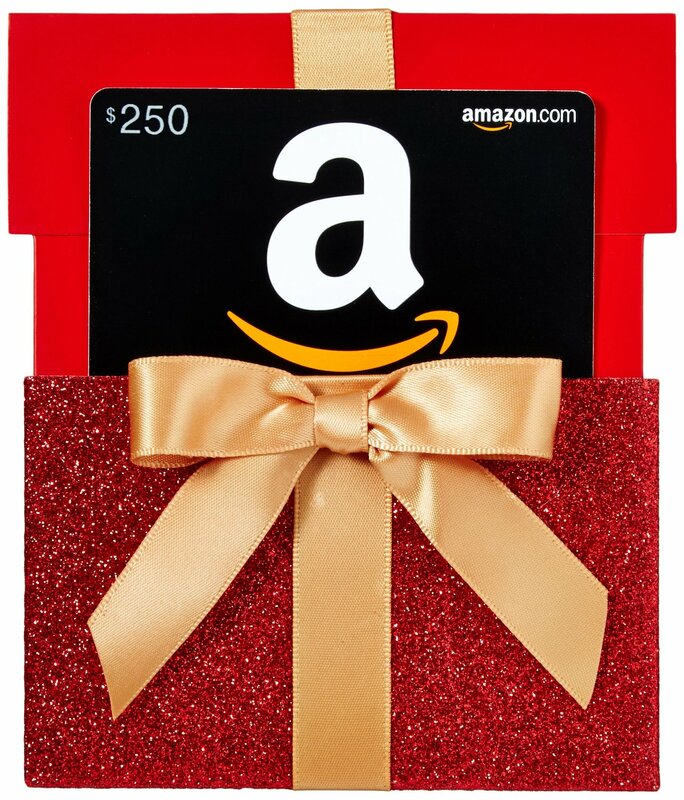 One lucky person will win a gift card of their choice.. Amazon, Walmart, Target, etc. Giveaway is open WORLDWIDE, we want all of our readers to join in the fun. You must be at least 18, and use the giveaway widget below to enter. This fabulous giveaway will end on 9/11/2016 at 11: 59 pm EST. Good Luck Everyone! Don’t forget we have tons of other fabulous giveaways happening right now! Just look on the right hand side of our page under Current Giveaways to see them all! You can also snag our FREE e-cookbook Simply Sweet Desserts HERE. As a mom of fove this would be fantastic, good luck everyone. This blog is awesome so glad to see people helping others, who might need something like this. Would love the Amazon gift card as I am a huge reader and purchase my ebooks through Amazon ? Thank you for the great opportunity ? Pick me. Thanks for the contest. Hi, there. I’ve been having trouble with Jenn’s Blah Blah Blog site. Also, I accidentally entered a Powered By Mom entry in Jenn’s Blah Blah Blog entry. 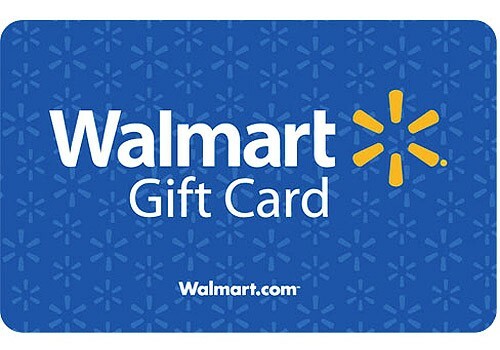 Would like to win the Walmart gift card because would be great for back to school so I can buy clothes and school supplies. Would help very much since I start school on September ? need a visa card soooooooooo badly, please dear god, pick me! Would like to win because it would be amazing to win I would pick the Walmart gift card if I win thankyou for this great giveaway. Thank you! For this cool giveaway $250 Winner’s Pick Gift Card Giveaway hope I be the luck winner. ?